Startup pitch competitions are getting more and more popular each year. Almost any college or university that has an entrepreneurship program hosts at least one pitch competition annually. More importantly, the prize money keeps growing with some competitions yielding $100,000 to be split among first, second, and third place winners. To help prepare young entrepreneurs for their pitch competitions, I opened my scribbled notes, questions, and comments from many years of witnessing, judging, and administering pitch competitions. The result is that I have extracted what I think to be the best questions for which you should prepare. 1. What are your top two or three priorities after this competition? 2. What is your startup going to be known for after year one? 3. How does your product/service work and how big is the market? 4. Who is your customer and do you know what your customer acquisition cost will be? 5. What proof is there that this is a real problem? 6. What is it about your team that makes them perfect to bring your product/service to market? 7. If you win this competition, what will you use the money for? 9. Who are your competitors and what will be the biggest challenge in unseating the top competitors in your market? 10. Do you plan to protect your product/service? If so, has a provisional been filed? 11. What proof is there that this is the right solution? 12. Why can't another company do what you are doing? Why can you do it better, faster, and/or more effectively? 14. How much traction do you need to obtain to clearly define your solution is working? 15. Why is right now the right time to solve the problem this way? 17. Can you explain your revenue model and how you came up with it? 18. What’s your average margin? 21. How often does your product/service show up in your average user’s day or week? Are those numbers sustainable or projected to grow? 22. What is the most probable way you will scale this business? 23. What regulatory approvals are needed to get your product or service to market and how have you progressed so far? 24. What is the top business metric(s) you will be monitoring right out of the gate with your business and why? 25. I know it is very early, but what do you see as the most logical exit down the road? Share with us your favorite question from a pitch competition in the comments below. Best of luck to all of the young entrepreneurs getting ready for the next pitch competition. Give your presentation to as many audiences as you can, because each can provide a valuable perspective. Practice, practice, practice...and then practice some more. The more you make your two, five, or eight minute pitch, the better. Many of us accept what we own without questioning where it came from or how it got to us. Trucking is the mode of transportation that carries 70% of all freight transported in the United States, accounting for $671 billion of goods carried annually. The industry itself generates $225 billion in total revenue each year, making up 10.2% of GDP in the United States. Without trucking, American businesses, governments, and homes would come to a halt. The reliance on the trucking industry has only grown with decreasing product cycles and increasing consumer demands. While the industry is constantly adapting to be more efficient, it still is fueled by outdated technology reliant on fossil fuels. In turn, the increase in transportation has stimulated an increase in greenhouse gas emissions in the trucking industry. This paper will cover some current issues surrounding trucking and why they will stimulate change, what companies are doing to make trucking more sustainable, and the change consumers can spark in the industry. ​One of the major issues in the trucking industry is reliance on fossil fuels, which are harmful to the environment and to a company’s bottom line. On average, 88-92% of a trucking company’s revenue goes towards operating costs, the highest being labor closely followed by fuel. According to the American Transportation Research Institute, fuel accounts for 30-40% of a motor carrier’s Cost Per Mile (CPM) and is projected to increase with higher fuel prices this year. This coming summer (2018), gasoline prices are expected to be higher than they have been in four years (Table 1). China alone increasing its oil consumption by more than 350% since the 1980s. In addition to this, President Trump and the US Chamber of Commerce are working towards phasing a $0.25 tax increase on fuel over the next five years. 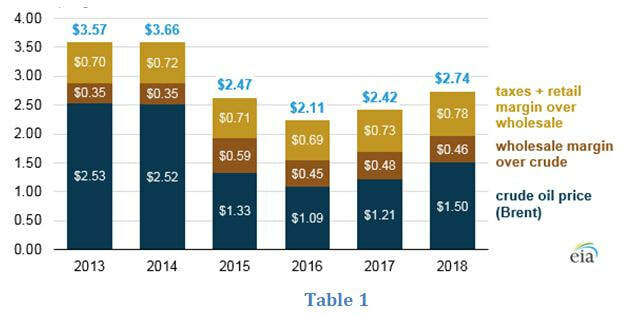 While this will go towards improving transportation infrastructure, trucking operations will experience higher operating costs as a result. An increase in the price of deliveries is not a feasible option to outweigh fuel costs, because of the highly competitive nature of the transportation market. Instead, companies must turn towards decreasing consumption of fuel and increasing load and route capacity. This turns the solution towards procuring sustainable trucks and software that support low fuel consumption, and, in turn, decrease greenhouse gas emissions. Outside of the monetary issues within the trade itself, the trucking industry has faced continued scrutiny over safety related issues involving passenger vehicles, commercial trucks, motorcycles, bicycles and pedestrians. In 2016, there were 3,986 fatalities from accidents involving commercial Class 8 trucks with 66% involving passenger vehicles and 17% involving other commercial trucks. 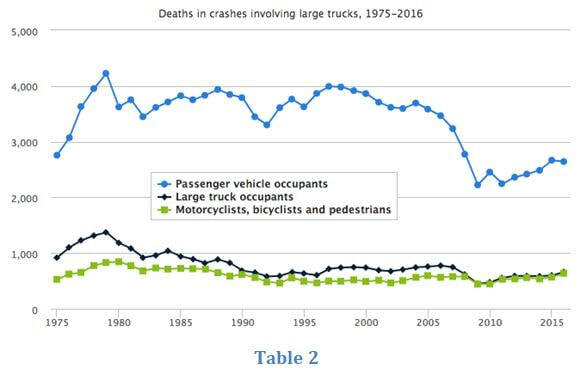 While the industry has seen an overall decline in deaths since 1975 (Table 2) it still accounts for 11% of fatalities on roads, leaving room for vast improvement. With companies realizing the positive impact sustainability has on both their bottom line and safety, many are taking action to further integrate it into their business model. Three methods they are using are route planning, fuel-efficient technology, and pre-ordering emissions-free vehicles. Route planning technology is not like Google or Apple Maps, because it tailors the directions to large trucks, taking into account fuel costs, turns and terrain. These systems are improving every year, with the majority of motor carriers using them in their operating structure. With over 40 systems competing in the current market, companies can cater the software to their specific needs and services. Because of this, route planning has become the norm in the trucking transportation and delivery markets, realizing billions of gallons in fuel savings over the past ten years. This technology will only continue to adapt and improve with changes in infrastructure, Artificial Intelligence (AI) capabilities and fuel-efficient trucks. The need for increased fuel efficiency in trucks can be seen in the 53.3 billion gallons of fuel was consumed for business purposes alone in 2015. Fuel economy standards call for semis to have 7.2MPG on flat roads, but, realistically, the average truck only receives 5.6MPG when taking into account speed fluctuations, terrain variability, road obstructions and other obstacles that decrease fuel economy. Many companies are already combatting this with ways to increase fuel efficiency through hybrid trucks and platooning. The Department of Energy (DOE), commissioned Volvo to create a concept semi truck that increases fuel efficiency by 50%. Since 2011, Volvo has been developing technology that has realized a 70% increase in fuel efficiency, 40% decrease in drag and optimized trailer capacity. While this truck is not going to hit the roads anytime soon because of high production costs and an expensive price tag to consumers, other companies, like Freightliner and Kenworth, are working on similar projects that could enter markets earlier. 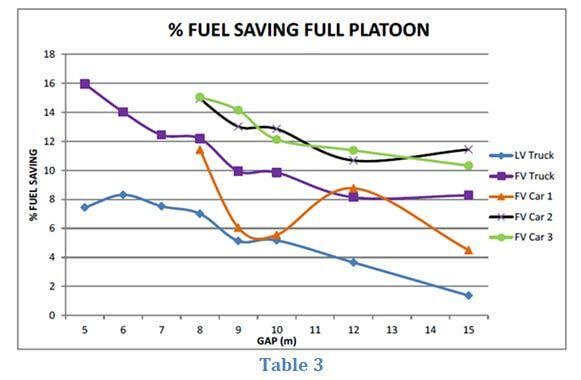 Platooning integrates wireless communications, radar-based automated braking systems and real-time weather, road and construction updates to generate over 10% in fuel savings (Table 3). In a fleet with this technology, linkage of multiple trucks reduces aerodynamic drag, avoiding nearly 50 million tonnes in carbon emissions over its lifespan. Platooning also uses radar detection to create a safer environment for vehicles on the road. Its detection software will allow trucks to have a quicker reaction time to speed fluctuations and maintain a safe distance from commercial and passenger vehicles ahead. ​The next step in fuel economy improvements is eliminating the need for fossil fuel completely. Hydrogen fuel cell and battery powered trucks will soon takeover the short-haul industry and be integrated into longer hauls in the near future. Hydrogen fuel cell trucks create their own energy by pulling electrons from compressed hydrogen in a compact fuel cell stack. They are refueled by hydrogen refueling stations, which are not prevalent in the US right now. Because of this, there is a bottleneck in their inability to travel long distances. An example of this is Toyota’s hydrogen fuel cell truck, which began drayage testing in the Port of Las Angeles to make short hauls to local DCs and warehouses. Its success is evidence that this technology could transform last-mile deliveries to commercial and residential areas but lacks flexibility in the services it can provide. However, this innovation does have room to grow, with Nikola recently unveiling their Nikola One hybrid hydrogen fuel cell truck with a range of 500 – 1,200 miles. Companies won’t be able to benefit from its efficiency until it begins production in 2021 and develops proper hydrogen refueling stations. Until then, local deliveries by hydrogen powered trucks will become more efficient and prevalent with continuous R&D. In November 2017, CEO and Chairman of Tesla, Elon Musk, announced that the fully electric powered Tesla Semi would hit production lines in 2019. In its unveiling, Musk discussed its 500 mile range, platooning and self-driving capabilities, aerodynamic design, and low operating cost. Traveling alone, the Tesla Semi decreases operating costs by 14.37%. This savings in operating costs is considerably increased to 43.71% when the Semi engages in a platoon convoy. Motor carrier leaders like JB Hunt and Wal-Mart have already placed orders for Tesla Semi fleets, and the public can expect to see them piloted over the next year. While the integration of these vehicles creates questions about where the hydrogen and electricity are coming from and the sustainability of the production process, industry leaders paired with market entrants are setting the pace to revolutionize our energy source for delivering goods. While it is easy to put the task of lowering commercial transportation impacts solely on companies, consumers must also evaluate what they are doing to drive the problem. At the heart of global demand increases that have stimulated increased transportation and emissions is consumer demand. 20th Century innovation and invention have enabled the population to have limitless access to real-time information, instituting the ease of making online purchases. E-commerce companies utilize free express shipping as a leverage point to capture consumer interest; however, when a consumer uses this express shipping option, it drastically lowers a company’s ability to fill a truckload. Lower truck capacity means more loads that go out, increased fuel consumption, higher company variable costs, and unnecessary packaging and emissions. On top of that, many companies are actually losing profit margin when providing that option for free. Waiting two or three extra days for a package to arrive allows the company to fill more loads and travel fewer miles. Choosing standard shipping, purchasing sustainably sourced products and educating others on where their products are coming from and how they got there are just a few things consumers can do to take action. The result of these actions will give consumers a different perspective on consumption and promote the companies and industries that are doing their best to be sustainable in production and transportation practices. Over the coming years, the trucking industry will experience exponential change, sparking an overall decrease in fuel consumption and emissions that have been negatively impacting the environment for too long. With variable operating costs absorbing 90% of revenues, companies are realizing the correlation between sustainability and safety, monetary and market benefits. Today, trucking market leaders are setting the pace for a more sustainable future, where the gap between modest change and emergent failures will steadily be closed. This will be accomplished through the technologies that enable fuel efficiency, increased safety and decreased labor demands that lower the cost to the economy, society, environment, and future generations. Lauren McGlon is a senior at Auburn University's Raymond J. Harbert College of Business studying Supply Chain Management with a minor in Sustainability Studies. Lauren has held multiple leadership positions within the College of Business, Alpha Kappa Psi, and Auburn's Supply Chain Management Association. Even in the early stages of building a business, many entrepreneurs are attracted to exploring patents. For most entrepreneurs, protecting your business idea from getting stolen is usually a priority. As a young entrepreneur, I made a lot of mistakes. One of those mistakes was not protecting the intellectual property (IP) with patents in my businesses, specifically the processes, software, and designs I created. 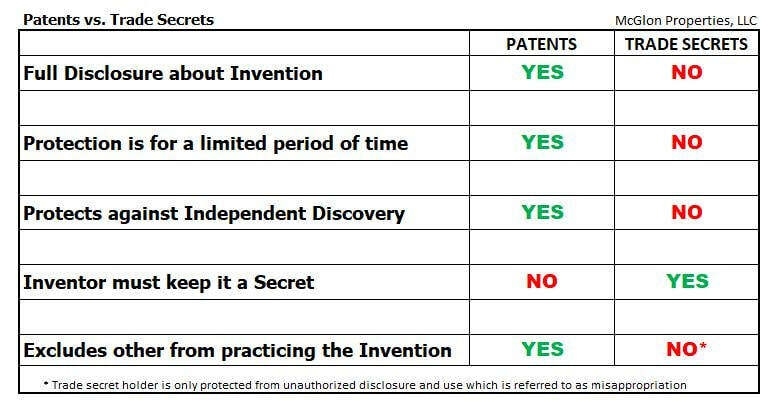 Of the four different IP's identified by the USPTO (trade secrets, copyright, trademarks, and patents), patents are the most expensive, time consuming, and carry an unknown result going in. For the most part, not pursuing patents did not hurt me. I stayed focused on operations and executing my business plans day in and day out. If I spent thousands to protect my ideas, I would spend thousands defending them once patented. Always remember that an idea is just organized thoughts. Writing out the idea, putting a team together, and executing that idea takes special entrepreneurial characteristics most do not possess - even if they want to knock off your idea. ​So, as an entrepreneur, you have to make the decision on whether or not protecting your idea(s) with a patent is the best route to take. No matter what you hear, I know for a fact that getting your idea out there, establishing market momentum/sales, and putting strong processes in place to duplicate success trumps spending months applying for and waiting to get "protection" in a lot of new business startups. I've actually seen, multiple times, young entrepreneurs spend the majority of their critical early startup time talking with attorneys, paying those attorneys, and filling out paperwork. Yes, there are plenty of true proprietary ideas that not only "need" protecting but MUST be protected with technology leading the way. Just know if Apple, GoPro, and many other billion dollar publicly held companies can't stop patent infringement, you will struggle as well. ​Reach out to a patent attorney and ask if they will evaluate and give a frank assessment if your business idea is protectable. Understand that there are quite a few that will take you down their sales pitch and sell you on their process. Stick to YOUR process and stay in control by not signing or agreeing to anything. Your goal is to get an opinion. Do a patent search on your own. There are two clear paths in doing your own search: Google Patents or directly through the United States Patent and Trademark Office. Do a search on how to do patent research. Use many different keywords to see what other patents exist and what was granted a patent. Your very next step is to get a provisional patent application completed and in to the USPTO office. This allows you to put "patent pending" on your docs, website, app, etc. This gives you 365 days to jump start your business. You do NOT need an attorney to file for a provisional patent. There are a lot of reputable online companies that charge $100 or less to get your provisional filed with the USPTO. Don't be lazy! ​Since business names are often tied to the actual business idea, Trademarks can be very useful and can serve as an additional layer of protection. Unfortunately, a lot of new entrepreneurs forget to check if their new company name or artwork has been trademarked already. The documentation that is required to file a trademark will serve as written official proof that your idea was set-in-stone on the specified date you filed. For no other reason, this justifies getting your biz name, tag line, and logo trademarked. At the very least, get your name completed. Another way your fears hurt your business is that they keep you from getting feedback from others. When you discuss your idea with someone new, you get their thoughts, which in turn helpsyou grow your concept. By never discussing your business with others, you miss that chance. There are a lot of entrepreneurs who like to start a business with a partner with thoughts that it will be easier, less risky, and that you will have someone to lean on. What is a clear fact based on statistics, a partnership that is formed without a thorough due diligence and clarity of responsibilities & roles is likely to fail. Trust me...I know first hand! So what makes successful partnerships work? I am going to share my experiences and opinions. ​According to the United States Small Business Administration (SBA), businesses with multiple owners are more likely to survive longer than those who go out on their own. The basic new start-up stat everyone uses regarding 66% of new businesses fail within the first year or two is a motivating factor to cover up this statistic the best you can. Some think going into a partnership arrangement helps reduce the probability of being a part of this stat...and I agree under the right circumstances. It is a fact that partnerships are the simplest and least expensive of co-owned business arrangements. Forming a partnership can either be a good or bad thing, depending on the parties and circumstances involved. ​​Your partner needs to be more smarter than you. Friends or family as partners can increase stress, forces decisions that wouldn't be made if the friend or family factor was not in the picture, and creates a level of sensitivity that crosses into the personal side of things vs. staying all business. If a partnership is the direction you plan to go, make sure your operating agreement, articles, and partnership agreement covers you under all circumstances. Are you the partnering type? Some entrepreneurs simply want to be on their own, are not good with sharing ideas, or even sharing the spotlight. A lot of pride has to be pulled back under a partnership knowing everything is split one way or another. Making decisions with compromises at every turn is much more challenging than just making the call and going with it if you are running solo. Work ethic, values, and experience is CRITICAL when deciding if you can partner with someone. If you find yourself consistently outworking your partner, questioning your partners decisions or actions, or find out they are not even experienced enough in all or certain areas, frustration, stress, and disappointment WILL build over time and ultimately hurt the business and your health. Partners share the cost of a start-up. They share responsibilities and work. They share business risks and expenses. The complementary skills and additional contacts of each partner can lead to the achievement of greater financial results together, faster, and with more diversity. Partners can offer mutual support and motivation. Partners in a general partnership are jointly and individually liable for the business activities of the other. If your partner skips town, you’ll be liable for all the debts, not just half of them. You will share the profits. In the beginning, this makes it more of a challenge with a higher burn rate, longer time to build up operating cash, and overall more expenses to cover both partners and their families. You do not have total control over the business. In most cases, decisions are shared, and differences of opinion can lead to disagreements, one partner buying out the other one, or even a dissolution of the company. The wrong partner can negatively affect your reputation. ​Before entering into a partnership, it would be best to first determine whether or not you are suitable for this type of arrangement and, if so, to thoroughly investigate possible business partners. Do we have a similar vision, ideas and objectives about how to run the business? Is each of our strong points and skills complementary to one another? Are we both able to communicate well with one another in a pleasant, respectful and comfortable manner? In your gut, do you trust this individual? You will also need to do some research about your prospective partner. Check out the individual’s background thoroughly by, for example, talking to former employers or business partners. Avoid any potential problems by making sure duties and responsibilities of each partner are detailed in a legal agreement. This agreement should include how much capital each will contribute; who owns what; how decisions will be made, profits will be shared, disputes will be resolved; a buy-sell agreement; and who will be entitled to what if the partnership doesn’t work out. Be sure to involve a lawyer and an accountant from the outset to help form your partnership and to draw up legal agreement to avoid unexpected circumstances. ​No doubt, deciding whether or not to work under a partnership arrangement is a major decisions for you, your family, and your career. A lot rides on how the partners handle everything that is involved with the business and what decisions are made. As an entrepreneur, everyday I treat each day as a new challenge. Knowing my options are endless (play golf, watch sports, go fishing), if I elect to get up and work, I bring my "A" game every time. So, what are some of the attributes an entrepreneur possesses vs. people who elect to work for someone else have? The following are the "special" characteristics that run through the blood of every proven entrepreneur. Fear. Not many entrepreneurs will admit it in public but most possess the fear of failure. Knowing that failure is an actual possibility becomes the fuel toward success. The insignificant cost of failure is nothing in comparison to the huge cost of not trying. Thinking. Not just regular thoughts but deep intellectual thinking regarding the start-up, established business, or ideas for the next project. Sure, everyone "thinks" but true entrepreneurial thinking is usually at a level that dissects the good, the bad, and the ugly and what it will take (sacrifices) to overcome all of the challenges defined. Planning & Prioritizing. The hours are countless when it comes to planning out and prioritizing the many tasks that make an entrepreneur successful. Strategy. The numerous hours breaking down the challenges surrounding an entrepreneurs business and the strategies to profit and counter them are usually home-runs to those who know how to implement defined strategies and differentiating factors successfully. Execution. Every entrepreneur I know spends more time actually executing vs. talking about executing. Great ideas, great plans, and even great products & services must have a consistent and powerful execution engine behind them. The old saying "talk is cheap" applies to every person who want to become a successful entrepreneur. Strengths. Most entrepreneurs clearly know their strengths but few consistently "sharpens their saw" on a regular basis. Spending time and resources in personal development is critical if you want to separate yourself from others in the space you want to be successful in. Emotional Intelligence. Some folks call it "soft skills" but emotional intelligence is more appropriate. This is an area I consistently find myself struggling with. Your personal attributes that enables you successfully interact effectively and harmoniously with other people is important if you want to open up the many doors that are in front of most entrepreneurs. Mirroring. Knock your self-pride out to the side every moment you can get. More specifically, follow, watch, and study those who have the results that you want for your start-up/business. Then mirror it - just better. Discipline. From the time you wake up until the time you go to bed, make wise choices that optimize your resources - especially the time you have decided to focus on the business you want to be successful. Choose when to use your computer, smart phone, tablet, text, and anything else that can completely destroy your daily plan. Again, this is an area that is extremely challenging to a lot of entrepreneurs. However, the ones that conquer being disciplined, are the ones that are usually the most successful. No. Be ready and willing to say "no" that do not fit your plan and/or strategy. Remember that each day has a time limit so always focus on your goals. Network. Build a network that covers every aspect of your business and then invest in it daily by staying in touch and introducing your network to others. You never know when your network will come in handy when you need a contact that has already been vetted. Time. Consistently invest time with those who mean the most to you. Sounds corny but staying grounded, loving, and respectful toward those who might not understand you but love you unconditionally is important. Know that your journey must be supported by the ones that mean the most to you. Limits. So many entrepreneurs hang on to their past relationships that won't or can't understand what you are wanting to accomplish with your business or the fact that you want to become a successful entrepreneur. Trust me in the fact that the majority of people will not understand your drive, focus, or actions. Shed all the toxic, negative, and bad influences in your path and seek like-minded people that share your aspirations and drive. Respect. Be respectful to everyone you meet. You absolutely never know when the people you shrug off might come in handy somewhere down the road. More importantly, being respectful to everyone defines your character from those who might be watching from afar. Invest. Be invested to both who mentor you and to those you end up mentoring. This circle should always be spinning and should end up as one of your most highest returns of being an entrepreneur. Upload. Whether its time you invest in daily or weekly, make sure you seek input, constructive criticism, and advice from those you know and respect well on areas you are not 100% confident with. Define. Understand yourself and your capabilities. Define characteristics that are important to follow daily and make it a discipline that you do not stray away from but get better every week.